Investors who hold tokens in the programmatic lending protocol MakerDAO appear likely to approve a fifth fee increase that would further raise the cost of platform’s US dollar-backed stablecoin DAI. Since Monday, five different options have been presented to MakerDAO token holders, all of which suggested different possible increases to the platform’s “stability fee,” the most extreme being a 4 percent increase. This preliminary round of polling has now ended and token holders look set to ratify that change in a final executive vote. Once ratified, the 11.5 percent stability fee will make it more expensive for users to take out programmatic loans of DAI by locking up ether as collateral. The aim is to reduce the amount of DAI in the markets and push up the stablecoin’s value, which currently hovers at $0.96, a figure that’s below the stable $1 price developers and users want to achieve. The news comes despite a 4 percent fee hike executed just last month and three other, smaller increases that have been approved and implemented to the code since February. 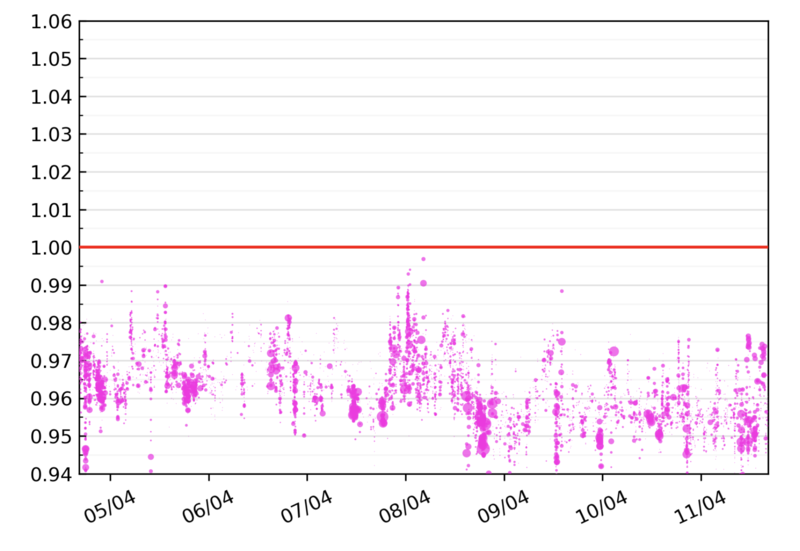 Yet, with all increases having proved ineffective in stabilizing the DAI peg, some users are now calling for a different approach to reducing circulating DAI supply. “At some point soon, it may make sense to lay off the [stability fee] hikes and rely on the 100 million supply cap to restore order,” writes Ryan Sean Adams, founder of crypto asset investment company MythosCapital, on Reddit. This suggestion to change the hard supply cap of 100 million DAI was also raised as a point of discussion in today’s MakerDAO governance and risk call. “I’d say if we don’t see an improvement in the DAI price by next week we consider reducing the debt ceiling in addition to a [stability fee] raise,” wrote Matthew Light in the call chatroom. “MakerDAO should want to accommodate as much debt ceiling and DAI generation as possible barring risk of collateral failing for the system. Messing with the DAI ceiling to affect the price of DAI seems like not the right approach,” said Younessi. Echoing Younessi’s hesitation, call participant Lawson Baker called instead for more aggressive and dynamic fee hikes. “Using the DAI supply cap/debt ceiling is the functional equivalent of shutting down your app for new users. This is a bad idea … Increase the costs until [user demand] slows enough to stabilize the system.” wrote Baker in today’s call chatroom. For this to work, Brown emphasized the importance of continued voter turnout by holders of the MakerDAO governance token each week until DAI peg stability is restored.